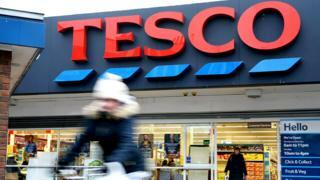 Tesco says its growth plans are on track after it reported a 10th consecutive quarter of rising sales. UK like-for-like sales, which strip out the impact of new stores, rose 2.1% in the 13 weeks to 26 May. The supermarket giant said sales had recovered after being affected by bad weather conditions in March. Tesco chief executive Dave Lewis said he was "delighted with initial progress on Booker", the food wholesaler that Tesco bought at the end of last year. Like-for-like sales at the wholesaler - which owns the Premier, Budgens and Londis store brands - rose 14.3% in its first quarter under Tesco's ownership. Mr Lewis said he was "pleased with the momentum in the business". Tesco's first quarter sales were a slight slowdown from the 2.3% rise in the fourth quarter, but the group said they were held back by March's heavy snow which put people off going shopping. Mr Lewis said the supermarket was continuing to focus on re-launching its own brand range and was now more than a quarter of the way through this. The own-brand re-launch is part of Tesco's plan to take on discounters Lidl and Aldi, which continue to win market share from the bigger supermarkets. Despite the competition, Tesco is still by far the UK's biggest supermarket with a 27.7% market share, according to the latest figures. Tesco's performance has gradually improved since 2014, when it reported the worst results in its history with a record pre-tax loss of £6.4bn. Mr Lewis is credited with turning around the group, and his total pay packet was almost £5m last year, a sum some have called excessive. But Derya Yildiz of Kantar Consulting says there is a case to say he is worth it. She told the BBC's Today programme: "If you are looking at it on the basis of one year's performance, that might be a discussion [to have]. "But as a CEO he promised to turnaround the business, and he would argue that he did this and signed off one of [the sector's] biggest deals with Booker, although this is yet to be proved." Neil Wilson, chief markets analyst at Markets.com, said Tesco's performance was better than expected. "[It] is a healthy performance given the pressures it faces in terms of discounters. "It does represent a slight softening from the last two quarters but it would be churlish to punish such a performance," he added.